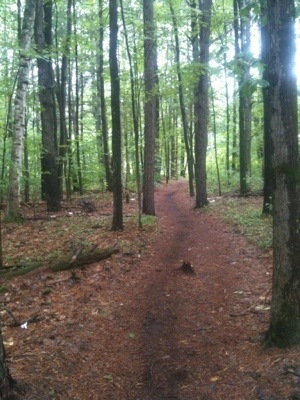 A recent rainy Monday found me on a break between two client’s in the Hudson Point Nature Preserve. This nature preserve is a 2 minute walk from the garden I was working in; 10 minutes drive from Lake George and 20 minutes from Saratoga. This particular wildlife habitat gets significantly less press and applause than the Wilton Wildlife Preserve, which is in Saratoga. 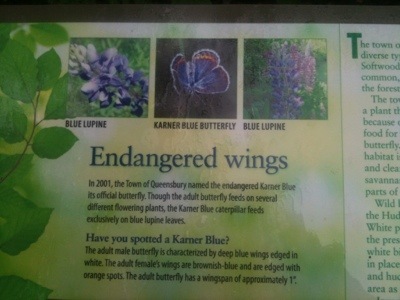 The truth is the two spaces are sisters, linked in the ecological network known as the, ” Connected Pine Grove.” Ecologists coined this term based on the environmental features neccessary to sustain habitat for the endangered Karner Blue Butterfly. The particular features are Eastern White Pine forests, sandy soil and Blue Lupine Plant. Blue Lupines like a sandy soil and sometimes have trouble integrating into Saratoga gardens (and Lake George gardens) because of the amended soil’s high nutrient content and- relatively speaking- poor drainage. It helps me to remember the beauty and uniqueness of this geographic region when I look at it through the Ecology lense, and remember the Connected Pine Grove. I no longer see as much artificial or manmade subdivision and compartmentalization. This entire ecosystem has a distinct flavor- and that is what I keep my eyes glued to.